Kayaking is an excellent way to explore Sarasota and Lido Key. There’s so much more to Sarasota than Siesta Key and beautiful beaches! Let’s explore what to expect on your kayak adventure. 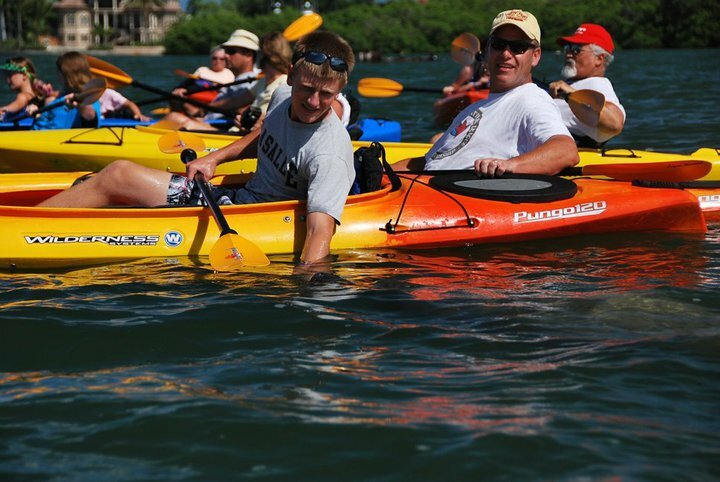 A kayak tour is the perfect way to make your Sarasota vacation more memorable. What better way to connect with family and loved ones than with a kayak trip on the water exploring the beautiful estuary of Lido Key? Our experienced guides get you up close and personal with dolphins, manatees, local exotic birds as well as other native wildlife. These are memories that will be cherished for a lifetime! Kayaking can be just as exciting as it is relaxing. Of course it’s exciting when you come across a manatee or a dolphin. Our experienced guides will teach you all you need to know about safety and paddling. You’ll also be equipped with safe kayaks as well as clean and comfortable life vests. Yes, just about anyone can kayak, but there are different types of strokes that make kayaking easier, especially when we go explore the exotic mangrove tunnels in Lido Key. There is the forward stroke which is most commonly used. On occasion you will need to use a kayak reverse stroke, especially if you want to go back and get a better look at something or to slow down. There is a sweep stroke, should you want to spin around. There is also something called the kayak draw stroke, this is mostly used when you want to go sideways, or pull up alongside something like a mangrove tunnel to let someone pass, or perhaps slide next to a buddy to snap a photo! If you want to try something new and exciting, and see a side of Sarasota you can’t typically see, schedule a tour with Adventure Kayak Outfitters, the original kayak outfitter, you won’t be disappointed! Most people are familiar with Sarasota because of our beautiful white sandy beaches, specifically Siesta Key Beach. However, there are many other reasons to love our area. We are on the beautiful Gulf of Mexico with exquisite blue waters, warm temperatures and we are abundant with wild life. We see many examples of wildlife on our kayak tours, such as: • Bottle Nosed Dolphins • Manatees • Black Mangrove Crabs • Pelicans • Osprey • Egrets • Sea Stars • Sea Urchins • Herons • Roseate Spoonbills There are so many more, this is only a few. When you kayak through the exotic mangrove tunnels, you are taking an adventure on the very habitat that sustains many of these beautiful creatures. In Florida, we have three native species of mangroves. • Rhizophora mangle — red mangrove • Avicennia germinans — black mangrove • Laguncularia racemosa — white mangrove Mangroves are like a protected nursery for fish, crustaceans, and shellfish. They are also vital to our fishing industry, both sporting and commercial. 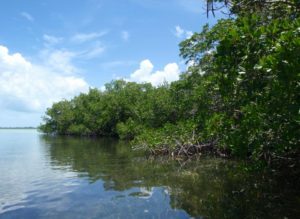 An estimated 75% of the game fish and 90% of the commercial fish species in south Florida depend on the mangrove system. The branches of mangroves also serve as nesting areas for coastal and wading birds such as the ones listed above. Not only do they provide habitat and shelter for animals, but mangroves also protect uplands from storm winds, waves, and floods. The seeds or pods that float in the water looking for their next sprouting ground can also be used to brush your teeth! Try it the next time you take a kayak adventure in the exotic mangroves of South Lido Key. There are so many more, this is only a few. When you kayak through the exotic mangrove tunnels, you are taking an adventure on the very habitat that sustains many of t hese beautiful creatures. In Florida, we have three native species of mangroves. Mangroves are like a protected nursery for fish, crustaceans, and shellfish. They are also vital to our fishing industry, both sporting and commercial. An estimated 75% of the game fish and 90% of the commercial fish species in south Florida depend on the mangrove system. The branches of mangroves also serve as nesting areas for coastal and wading birds such as the ones listed above. Not only do they provide habitat and shelter for animals, but mangroves also protect uplands from storm winds, waves, and floods. The seeds or pods that float in the water looking for their next sprouting ground can also be used to brush your teeth! Try it the next time you take a kayak adventure in the exotic mangroves of South Lido Key. Right outside the hub of St. Armand’s Circle in beautiful Sarasota lays the beauty of Lido Key. Lido Key is surrounded by gulf waters and Sarasota Bay. In South Lido Park, the waters are calm and serene. There’s so much to see. Guided kayak tours through the mangrove tunnels are one of the top highest things to do here in Sarasota. Our kayak trips have something for everyone. Sarasota Bay hosts about 140 bottle nosed dolphins that play in our waters. Manatees also call this home. They love it here because of the shallow waters filled with sea grass. Kayaking is much more than just getting in the water and going. Whether it be a guided tour, or a rental there are so many options for both. Our guided tours are fun for the whole family. We offer both Manatee and Dolphin tours which allow you to experience dolphins & manatees up close and personal in their native habitat. Our n ative Floridian guides are both informative and entertaining. 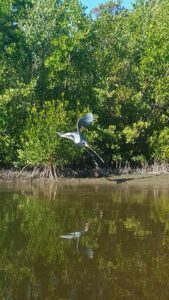 The Mangrove Tour allows you to explore the shallow waters of Little Lagoon and navigate your way through the maze of exotic mangrove tunnels that lead you into the sun-filled grass flats of brushy bayou and Big Grass Lagoon. There is truly excitement around every corner, and the lush mangroves offer some shade to cool off from the sun. With a kayak rental the choice is yours. Renters have the ability to explore the open waters and the mangroves at your own pace. There is even a little sand bar. You can pull your kayak up and sit and watch boats go by, wade in the refreshing water, or catch some rays!